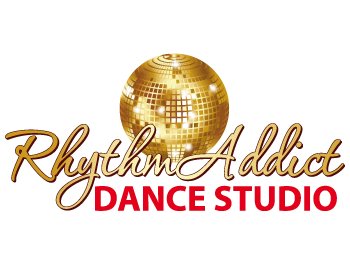 Our Friday nights at RhythmAddict are dedicated to "Date Night/Dance Night" for all our couples. It's the one class where you aren't constantly changing partners, you stay with the one you brought. We teach a variety of ballroom and swing dances, 10 in all. Each class is designed to teach you these dances to use out socially. Dancing is a great skill that comes in handy for any family party, weddings, cruises, etc. Learn the foundation so dancing is fun, you can impress all your friends and it's a great bonding activity together. We have 4 levels of each of the 10 dances. 1st month is always Beginner followed directly in the 2nd month with an Improver level. Just these two months will have you dancing socially with confidence. For more of a challenge, we also have Intermediate & Advanced level classes at an earlier time slot when you're ready to add more. Start with any Level 1 class of your choice. We break down the basics to make it easy to get started and having fun right away. And it's only $97 per couple for the whole month. Level 1 is listed on the flyer. The month after that will be Level 2. Both held at 8pm. Feel free to stop by the studio any Tue-Thu 7-9pm or Sat 9-10am to have someone at the front desk help you to register, otherwise you can register online. If you are online you'll see all four levels offered, so be sure to select any Level 1 class. If you're interested in this class but don't have a partner, fill out the Singles Match form below. We're building a database of other singles and sending out matches as they arrive.